Touring the Angel: Live in Milan is a live video album by English electronic music band Depeche Mode, released on 25 September 2006 by Mute Records. It was directed and filmed by Blue Leach at Fila Forum in Assago, near Milan, Italy, on 18 and 19 February 2006, during the band's 2005–06 Touring the Angel concert tour. Twenty Five is a greatest hits album by George Michael released on 2006, celebrating the 25th anniversary of his music career. It was released on 13 November 2006 by Sony BMG. It debuted at number one on the UK Albums Chart and number 23 on the Billboard 200, and it reached the top 20 on most other album charts. After Michael's death in December 2016, the album re-entered the Billboard 200 at a new peak position of number 12. ...All This Time is a live album and concert film by Sting, recorded and filmed on 11 September 2001. It was recorded at Sting's Villa Il Palagio in Italy in front of a select audience drawn from his fan club and features live versions of Sting's songs from his Police and solo song catalogue. The album and video get their name from the song of the same name from his album The Soul Cages. VH1 Storytellers is a concert and discussion DVD by Bruce Springsteen, expanded from the airing of an episode of the VH1 television series VH1 Storytellers on April 23, 2005. Tied into promotion for his album Devils & Dust at the time, it was released in video form half a year later. The discography of the Finnish symphonic metal band Nightwish consists of eight studio albums, one extended play, five live albums, seven compilations, thirteen music videos and twenty one singles. The band was formed in 1996 by songwriter and keyboardist Tuomas Holopainen, guitarist Emppu Vuorinen, and former vocalist Tarja Turunen; Nightwish's current line-up has six members although Turunen has been replaced by Anette Olzon and later by Floor Jansen, and the original bassist, Sami Vänskä, has been replaced by Marco Hietala, who also took over the male vocalist part. Olzon left the band in 2012 and was replaced by Floor Jansen. Live from Texas is a live DVD/Blu-ray by ZZ Top. It was recorded on November 1, 2007, at the Nokia Theatre in Grand Prairie, Texas, and released on June 24, 2008, by Eagle Rock Records. It was also released on audio CD in Europe on October 28, 2008, and in the US on November 4, 2008. A vinyl version is also available in Europe. Live at the O2 London, England is a DVD by Kings of Leon released on November 10, 2009. It features the band's show on June 30, 2009, at the O2 Arena in London, England. The concert was also released on Blu-ray. London Calling: Live in Hyde Park is a concert video of Bruce Springsteen & the E Street Band's performance during the Hard Rock Calling music festival in Hyde Park, London on June 28, 2009. The film was released on DVD and Blu-ray formats by Columbia Records on June 22, 2010. Stones in Exile is a 2010 documentary film about the recording of the 1972 The Rolling Stones album Exile on Main St. Directed by Stephen Kijak, it premiered at the 2010 Cannes Film Festival. It had its worldwide premiere on Late Night with Jimmy Fallon. Fallon announced on his show that he would mark the re-release of the album with a week's worth of musicians performing songs from the album. The final night of the week, he held the premiere. Songs from the Road is a live album by Canadian singer-songwriter Leonard Cohen. Released on September 14, 2010, it is his twentieth album. The discography of Joe Bonamassa, an American blues rock musician, consists of 13 studio albums, 16 live albums, three collaboration albums, 30 singles, 15 video albums, 13 music videos and 54 other appearances. Born in Utica, New York, Bonamassa began his career as a member of the band Bloodline, before beginning his solo career in 2000 with the release of A New Day Yesterday. The album reached number 9 on the US Billboard Blues Albums chart. The guitarist continued to see success in the blues genre, topping the chart with 2002's So, It's Like That and 2006's You & Me, before making his debut on the Billboard 200 in 2007 with Sloe Gin, which reached number 184. Bonamassa's albums have continued to increase in chart success over the years, with The Ballad of John Henry reaching number 103 on the Billboard 200, Black Rock, Dust Bowl and Driving Towards the Daylight reaching the top 40, and Different Shades of Blue and Blues of Desperation reaching the top 20. Several of the musician's video albums have also topped the Billboard Music Video Sales chart. Phantom Antichrist is the 13th studio album by the German thrash metal band Kreator, released through Nuclear Blast on June 1, 2012. GRRR! is a greatest hits album by the Rolling Stones. Released on 9 November 2012 in Europe, and the rest of the world on 12 November, it commemorates the band's 50th anniversary. The album features two new songs titled "Doom and Gloom" and "One More Shot", which were recorded in August 2012. 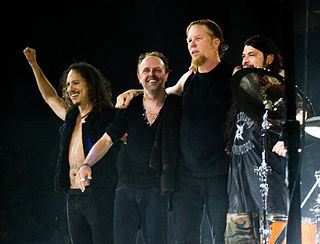 Quebec Magnetic is a live concert video album by Metallica, documenting two shows the band played at the Colisée Pepsi in Quebec City, Canada, on October 31 and November 1, 2009, on their World Magnetic Tour, released on December 11, 2012. The album is the first to be released via Metallica's own label, Blackened Recordings. Metallica: Through the Never is a soundtrack album for the film of the same name, consisting of live recordings by American heavy metal band Metallica. It was released on September 24, 2013 via Blackened Recordings and has charted in several countries. ↑ "Ultratop 10 Muziek-DVD". Ultratop (in Dutch). Hung Medien. Retrieved February 26, 2013. ↑ "Ultratop 10 DVD Musicaux". Ultratop (in French). Hung Medien. Retrieved February 26, 2013. ↑ "Suomen Virallinen Lista – Musiikki DVD:t 50/2009". Musiikkituottajat – IFPI Finland (in Finnish). Retrieved February 26, 2013. ↑ "Swiss Charts – Music DVD Top 10 06.12.2009". Swisscharts.com. Hung Medien. Retrieved February 26, 2013. ↑ "Musik DVD Top-10". Hitlisten.nu (in Danish). IFPI Denmark . Retrieved February 26, 2013. ↑ "DVD Music Top 30". GfK Dutch Charts (in Dutch). Hung Medien. Retrieved February 26, 2013. ↑ "2010-01-23 Top 40 Music Video Archive | Official Charts". Official Charts Company . Archived from the original on May 21, 2014. Retrieved February 26, 2013. ↑ "ARIA Charts – Accreditations – 2010 DVDs". Australian Recording Industry Association . Retrieved February 26, 2013. ↑ "Ultratop − Goud en Platina – 2010". Ultratop. Hung Medien. Retrieved February 26, 2013. 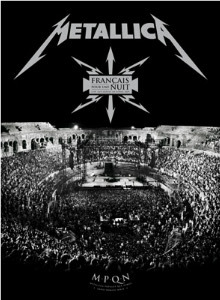 ↑ "French video certifications – Metallica – Français Pour Une Nuit" (in French). Syndicat National de l'Édition Phonographique . Retrieved February 26, 2013.